On Tuesday last week, Taproot Edmonton broke the story that the City Market will not be returning to 104 Street this summer. Instead, they’ll be relocating to the former Great Western Garment building on 97 Street, with plans to operate a year-round indoor market on Saturdays and Sundays. In addition to vendors, the building will provide the opportunity to operate a “Food Fair” with outdoor seating. Some on street presence will be maintained on 103 Avenue. Reaction has been mixed so far, and only time will tell whether this iteration of the market will attract the same type of crowds as it did on 104 Street. It looks like a burger restaurant called The Woodshed will be moving into the space formerly occupied by Solstice on 124 Street. Mill Woods bakery Reinette Cafe will be opening a location in West Edmonton Mall. The floor plan for the JW Marriott in the Ice District indicates that an Oliver and Bonacini restaurant is still forthcoming. Aarde on 104 Street closed over the weekend, despite only opening its doors back in November 2018. It’s perhaps even more unusual given they received a positive review from the Journal at the end of January; typically restaurants will see a bump in business after such coverage. It’s not a restaurant, but will be sad news for some home cooks: Williams Sonoma is closing their West Edmonton Mall location. The 14th annual Edmonton International Beer Festival takes place on March 22-23, 2019 at the Edmonton Convention Centre. It’s the biggest year yet, with 120 vendors and 300 beers to sample! General admission tickets start at $19 plus fees. The City of Edmonton is hosting an information session on March 25, 2019 for restaurant and pubs wishing to add a patio or sidewalk cafe to their business. The next Passion for Pork dinner will take place at London Local on March 27, 2019. Tickets for the four-course meal are $50. It’s interesting to see that the Edmonton Expo Centre, led by their their recently appointed Executive Chef Jiju Paul, will be offering their first Winery Spotlight Dinner on March 27, 2019. Tickets for the seven-course meal are $125. The Ritchie Community League is hosting its 6th annual Chili Cook-off on April 20, 2019. Tickets are $20. Stephanie shared the photos from her visit to Dauphine’s new space in Montrose. Crystal was impressed by the quantity and quality of the ramen at Tokiwa. Also from Crystal, she tried the pastries ordered from a relatively new business called Glaze Dessert Bar. Twyla was reminded of her trip to Vietnam after a recent visit to XO Bistro downtown. Graham applauds the marketing behind this year’s expanded Downtown Dining Week. It seemed to be pretty busy at the restaurants we visited, and some, like Hardware Grill, have decided to hold over their special menu for a few days due to popular demand. Some people were quite upset when the Hotel Macdonald revealed their plans to update the Confederation Lounge. Elise had a great opinion piece about liberalizing Alberta’s public drinking laws. Speaking of alcohol, liquor store separation distances are among the topics discussed on the latest episode of the Speaking Municipally podcast. Mack and I fit in one more Downtown Dining Week visit before the end of the week with a lunch at XO Bistro. They had a great $18 special, so it was a good reason to finally try them out. 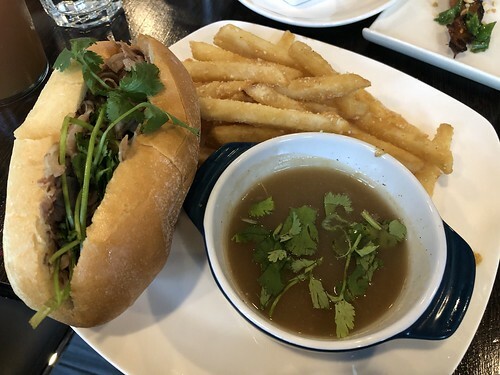 I enjoyed the flavours of the pho beef dip, but I’ll have to return for soup some time.